Your Excellency, kindly permit me to outline some of the background to this matter. I was born and raised in the United Kingdom, indeed my parental family home remains in London. My visits to Nigeria up until the age of thirty-four (34) were holidays, with visas obtained in my UK passport. I obtained my first Nigerian passport at the age of thirty-four (34) and when I relocated there was debate as to whether NYSC Law applied to me. Upon enquiry as to my status relating to NYSC, I was informed that due to my residency history and having exceeded the age of thirty (30), I was exempted from the requirement to serve. Until recent events, that remained my understanding. 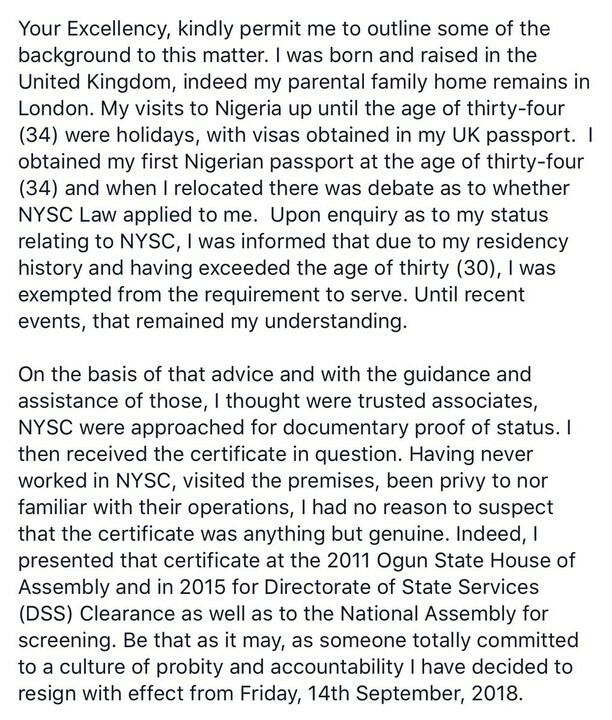 On the basis of that advice and with the guidance and assistance of those, I thought were trusted associates, NYSC were approached for documentary proof of status. I then received the certificate in question. Having never worked in NYSC, visited the premises, been privy to nor familiar with their operations, I had no reason to suspect that the certificate was anything but genuine. Indeed, I presented that certificate at the 2011 Ogun State House of Assembly and in 2015 for Directorate of State Services (DSS) Clearance as well as to the National Assembly for screening. 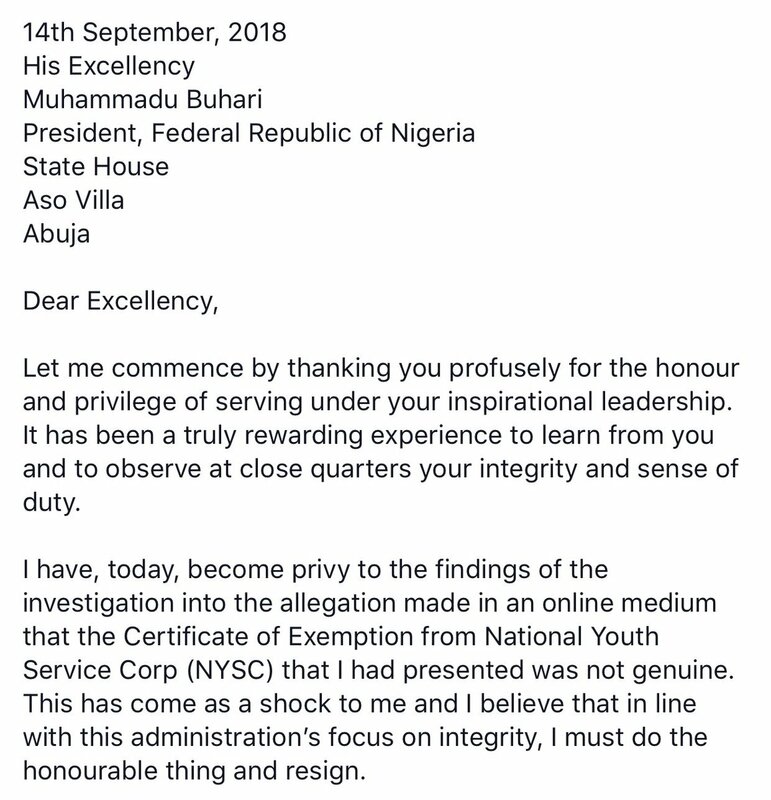 Be that as it may, as someone totally committed to a culture of probity and accountability I have decided to resign with effect from Friday, 14th September, 2018. Your Excellency, It has been an exceptional privilege to have served our nation under your leadership and to have played a role in steering our economy at a very challenging time. I am proud that Nigeria has brought discipline into its finances, has identified and is pursuing a path to long term sustainable growth that will unlock the potential in this great economy. Under your leadership, Nigeria was able to exit recession and has now started to lay the foundations for lasting growth and wealth creation. 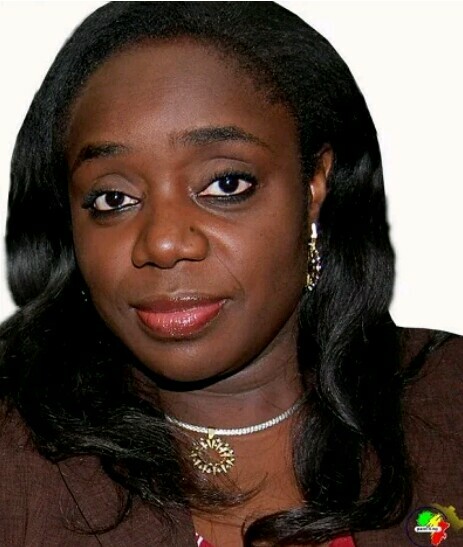 Repositioning this huge economy is not a short term task and there are no short cuts, indeed there are tough decisions still to be made but I have no doubt that your focus on infrastructural investment, revenue mobilisation and value for money in public expenditure will deliver growth, wealth and opportunity for all Nigerians. I thank His Excellency, the Vice President and my colleagues in the Federal Executive Council for the huge pleasure and honour of working with them. I also thank most specially, the team in the ‘Finance Family’ of advisers and heads of agencies under the Ministry of Finance. Your Excellency, this group of committed Nigerians represent a range of backgrounds, ethnicities and ages. They have worked well above and beyond the call of duty to support me in the tasks assigned. The diversity in my team and their ability to work cohesively to deliver reforms, convinces me that Nigeria has the human capital required to succeed. Please be assured, as always, of my highest regards and best wishes.